OT Lectionary – a weekly series of devotional thoughts on the OT reading for next Sunday. 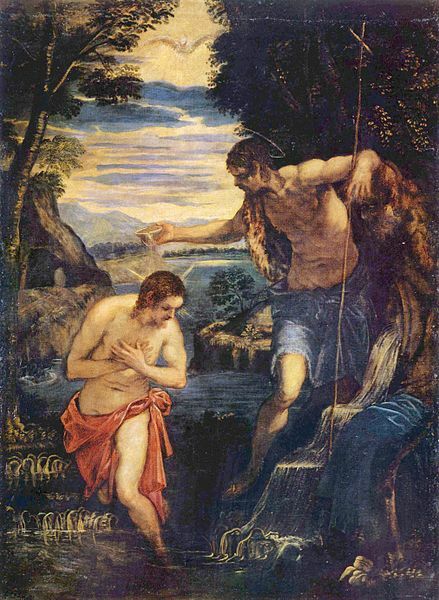 The Sunday after Epiphany is traditionally the time to remember Jesus’ baptism in the Jordan by John. Baptism is one of the most undervalued and misunderstood of the things Jesus left for us: as one brought up in the Baptist Church who only later became an Anglican I have had to do a complete rethink of my theology of baptism. So how can our passage from Isaiah speak to us today? Chapter 42 is the first of four ‘Servant Songs’ which appear in this section of Isaiah, and just about every theological student has had to write an essay on who exactly the ‘Servant’ was or is. Indeed this was the very question raised by the Ethiopian official in Acts 8. The consensus is that the Servant is the idealised nation of Israel, not weak, beaten down and exiled as she was at the time but renewed, powerful and fulfilling her destiny given by God to be a light to the whole world. The previous chapter of Isaiah talks about this. So this first Servant Song has parallels with the baptism which launched Jesus into public ministry as the one who fulfilled par excellence the role of ‘Servant’. The passage tells us about the Servant’s ministry, but also about the way that ministry will be carried out, and the basis from which it will be carried out. The first four verses explain the teaching ministry which is about justice and encouragement, and the passage goes on to explain that it will be an international ministry aimed at freedom and illumination for those in darkness. So what is this freedom fighter’s style? To a nation used to the harsh cries of Babylonian taskmasters (which no doubt echoed in the collective memory with those of Egyptian taskmasters hundreds of years earlier) the prophet explains that the Servant’s ministry will be gentle in style, encouraging in nature and with a bias towards those unable to help themselves. This is not the style of a zealot or rabble-rouser, but rather a leader more interested in winning hearts than battles. On what basis, then, is this ministry to be carried out? The answer is that it is a divine calling. God, through the prophet, labours his credentials: he is the creator, responsible single-handedly for the world and all its people: he is the God who alone is worthy of all honour, and who, just to prove the point, is the only ‘god’ able to predict the future. So you don’t argue with him, right? Springing from this God is the calling to the Servant, the one whom he has chosen, in whom he delights, and whom he will uphold, giving him his Spirit to empower him. Jesus at his baptism clearly fulfils this passage, and no doubt had it in his mind. As the Father tears open heaven and declares audibly his love and favour for his Son, Jesus is launched into his public ministry of teaching and salvation for all. But the whole point of this story is that the fulfilment doesn’t end with Jesus: our calling as his church, the ‘Israel of God’, is to be Christ’s body here on earth now, continuing the Servant’s ministry. And just as our calling is the same, so is our style and its basis. Today challenges us to reconsider, and maybe to recommit ourselves to, our own baptism and the calling and ministry to which it signed us up.